Time and again, I wonder why a change in Stephen Appiah`s role on the field of play. He was more of striker in his days with Hearts of Oak combining skill with hardwork to get expected goals for Hearts. I dont see anything wrong with his present role as such change hapens in football. Luthar Mathaus, Hanaafi Muhamed etc all resorted to unusual defensive role in their playing carrier. Didier Drogba started as a defender but now transformed Drogba scores as if he has been a striker for ages. I dont know how soon Ghana`s John Paintsil would revert to his usual midfield role now that his role as a defender is almost intitutionalised.This change in role is usually orchestrated by coaches to meet thier technical aspirations on the field of play. It would be a great news to Ghanaians if the Black Stars skipper Stephen Appiah should win the Africa Player award for the year 2004. However, considering the fact that previous winners have been mostly strikers, his chances look a bit shaky in my opinion. That does not matter anyway. Familiar names one of which is likely to win the award are Stephen Appiah, Michael Essien, Yakubu Ayigbeni, Obafemi Martins, Austin Okocha, Samuel Eto`O, Idris Kameni, Frederick Kanoute, Hattem Trabelsi, Henri Kamara, Kolo Toure, Aruna Dindane and Africa`s most expensive player Didier Drogba. The list goes on. Indded, Ivory Coast attacking duo of Dindane and Drogba (obviously/arguably Africa player of the moment) have really taken the country back into the mainstream of Africa soccer. Drogba who stopped play for a whole year in his carrier for the sake of successful re-sit of academic examination has been excellent since he came to Standford Bridge culminating in his eventual nomination for the FIFA player of the year award for 2004 alongside Eto`O, Adriano, Henry and 31 others. His huge "prize tag" does not guarantee him the award anyway. Austin Okocha`s $17m move to PSG made him the most expe! nsive African player, yet that was not enough to win him the award ahead of Morroco`s Mustapha Hadji in 1998. It is my desire that Appiah revert to his striking role to draw him close to the this big prize. 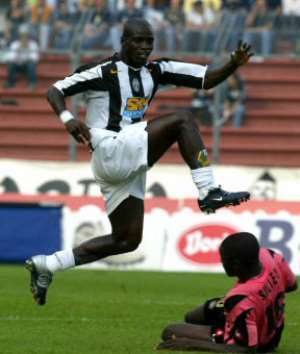 I dont think the likes of Zlatan Ibrahimovic, Zaleyata etc would have been far better than Appiah as a striker in Juventus. He is an "authority" in midfield. Nobody would deny this fact but at the same time it is historically obvious that marksmen (eg Abega, Weah, Milla, Mboma, Keita, Ikpeba ) other than defenders and midfielders are the most recipents of this huge prize. Africa player of the year award is the name of this big honour reserved for outstanding Africa footballers, yet it rarely goes to defenders, midfielders and goalkeepers. It is so at FIFA level as well. Ghana`s Samuel Osei Kufuor and Tunisia`s Hattem Trabelsi are the only defenders who have come close to the award in recent nominations. I believe Cameroon`s Thomas Nkonno would be the last and only goalkeeper to win this prize if things continue this way. I am not saying previous winners did not deserve it. However, if the trend continues this way, then all Africa youth who look up to this big prize in future would resort to playing upfront leaving no defender, midfielder and goalkeeper. The Appiah`s midfield role is appreciated. I admire his ball distribution so much. However, this does not stop me from "advocating" his return to striking role to possibly win him this biggest Africa football prize sooner than many years to come.